*While we're thinking about sowing some food for ourselves - it's more important than ever to sow some for pollinators too! Aubergines - (as early as possible in the month to get the best crops). Bonica F1 is best - this top of RHS trials & AGM about 15 years ago - I don't bother to grow any other now as it's by far the most reliable, alpine strawberries (Reugen a large-fruited var. ), globe artichokes, (if sown early in the month, they'll crop outside in autumn this year), dwarf French beans for cropping in pots or in tunnel beds later (choose a fast-growing, disease-resistant variety suitable for early sowing), asparagus, celery, celeriac (early in month) tomatoes, chilli and other peppers, physalis (Cape gooseberries). From mid-March onwards you can sow early courgettes for tunnel growing, and then later in the month melons and cucumbers for warm tunnel cropping. Don't forget melons and cucumbers need to be grown on in consistently warmer conditions than tomatoes to be really successful - they grow very fast and hate to be checked (this applies to pumpkins & squashes too - so wait until next month to sow them in pots if they're for growing outside). 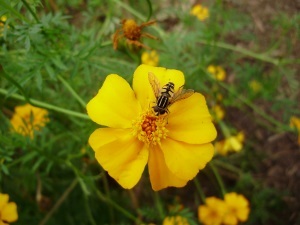 *Also sow some single-flowered tender annuals now like Tagetes, single French marigolds (Tall Citrus Mixed' is a good variety), etc.- lots of vital beneficial insects like bees, hoverflies, butterflies and moths really love these. Remember that by growing single flowers organically you won't just be helping to preserve them - but they will also help you, by helping with your pest control and pollination. Note - It's vitally important that they are SINGLE flowered, as bees, hoverflies and other insects can't access the nectaries of double flowers in order to feed - so those flowers are completely useless to them! They then have to fly elsewhere to find food. When their energy supplies are low, wasting time trying to get nectar from useless flowers can make the difference between life and death for many small insects including bees! Beetroot, broad beans and peas, spring and summer cabbage, calabrese, carrots, white turnips and radishes (in the soil for an early tunnel crop), onions, chives, Welsh (perennial salad) onions, scallions, leeks, lettuces and salad mixes early in the month, kales, rocket, spinach and coloured Swiss chards etc for baby leaves, fennel and 'soft herbs' like borage, parsley, dill, Greek oregano, salad burnet and coriander. 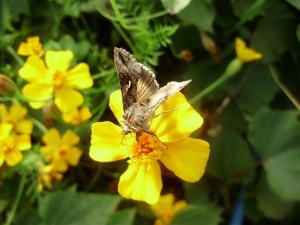 Other single flowered annuals like limnanthes, convulvulus tricolour and calendula (pot marigold) can also be sown direct into the soil in polytunnel beds now. Keep an eye out for hungry mice - they love pea and bean seeds - it's a good idea to put down a trap - but cover to avoid trapping small birds like wrens and robins. 'Caliente' mustard (generally available now, or from Marshalls and Unwins seeds - one packet will easily sow a bed about 20ft x 4ft.) This mustard is a very useful green manure as it acts as a natural 'biofumigant' by releasing a plant phytochemical in the form of a gas - called isothiocyanate. This suppresses a range of soil-borne diseases and harmful nematodes - it also encourages beneficial bacteria and soil micro-organisms, adds nutrients and really encourages worm activity. It's particularly helpful where the soil has previously grown tomatoes. A couple of weeks before planting the tomatoes, cut it down - chopping it up as finely as possible in order to release all it's beneficial compounds - and then incorporate it into the soil surface immediately - before the resulting gases escape. Then cover it with black polythene to seal the gases in. (see this month's polytunnel section). As it's a member of the brassica (or cabbage) family - make sure that it fits into your minimum 4-course rotation even though it will only be there for a short time. Phacelia is another fast-growing 'soft' green manure well-worth sowing now if you have space - this can also be dug in after just one months growth, will break down quickly and it isn't rotation sensitive, so it can be used anywhere. Leaving one or two plants to produce their pretty scented blue flowers later on will also really attract in the beneficial insects too! Red clover is also useful, because being a leguminous plant, it fixes 'free' atmospheric nitrogen which it concentrates in nodules on it's roots, made by beneficial microbes. 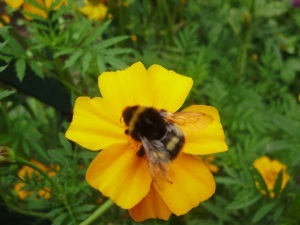 This is then released for the following crop (leave a few to flower for bees - they adore them!). Studies also show that growing a legume crop between tomato plants boosts their disease-resistance, bu encouraging beneficial bacteria..
Borage also makes a good very fast-growing green manure, with a long tap root which draws up valuable minerals such as magnesium from lower down in the soil profile. It breaks down easily when dug in and encourages good worm activity, as does claytonia (or winter purslane). Both Borage and Claytonia are useful in salads too. Beetroot, broad beans, carrots, mangetout and early peas, parsnips, late spring and summer cabbages, red cabbage, early Brussels sprouts, cauliflowers, calabrese and summer sprouting broccoli, onions (plant onion sets in pots for an early crop), leeks, spring onions, lettuces, kohl rabi, Ragged Jack and Cavolo Nero kales for baby leaves, radishes, Swiss chard, summer spinach, white turnips, American land cress, lamb's lettuce, salad mixes, 'soft' herbs like borage, parsley, dill, fennel, Greek oregano and coriander. There's a lot of nonsense talked about germinating parsley, but it just likes to be warm and usually takes about 3 weeks to germinate at anytime of year - it always finally appears just when you think it's not going to! It's also worth sowing some single, early flowering annuals in the open ground or in modules for planting out later - such as limnanthes (poached egg plant), calendula, cerinthe, convulvulus tricolor, borage, red clover and phacelia. They'll attract beneficial insects to help with pest control, encourage bees into the garden for pollination and also look beautiful - which is very important too. There's still just time to plant garlic early in the month. Only plant varieties clearly labelled as 'suitable for spring planting'' now - such as 'Christo'. Plant Jerusalem artichokes and also early potatoes in warm, well drained soils - protecting from frost with fleece later (see veg. garden section). These will crop early enough to completely avoid blight. Or alternatively - if your ground conditions aren't suitable - you could start them off in pots now for an early crop - I do this with all of mine now. You can also start off Yacon, Oca, Mashua and Ulluco tubers inside in pots of well-drained peat-free compost now for planting in the polytunnel or outside later - protect these carefully from frost when they start to produce shoots! PS! Don't forget that these are just suggestions for what you could sow now - not what you must! I found a checklist/reminder like this invaluable when I was just starting off many years ago - and I still do! Someone actually once complained that I gave far too much information!! So I thought I'd make that quite clear! You can't please everyone - and all the information here is free! Funny how we spend our time wishing away winter - then wishing everything would happen more slowly in spring - gardeners are never happy!